Please Mother Nature, no more winter clothes! I hope that before we know it, there will be sand in our toes! 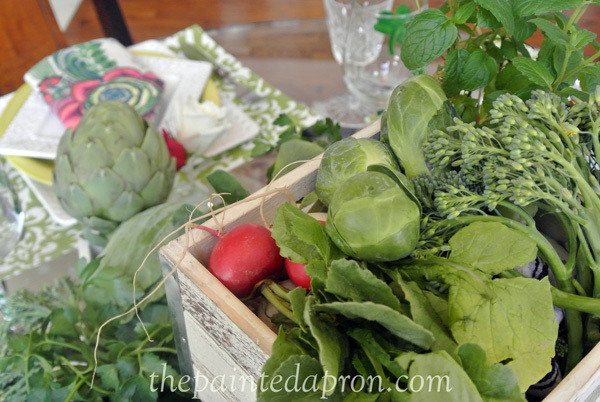 I went to Fresh Market and loaded up on gorgeous vegetables that we have been not only been enjoying eating all week, but just looking at them too! There is nothing better to chase the winter blues away! I just turned the label to the least visible side and covered it with cascading parsley….shhh…. 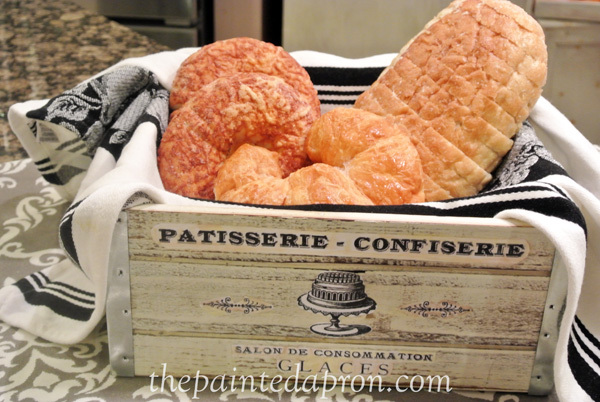 ← Holidays & Take-out Tuesday, Fat Tuesday! 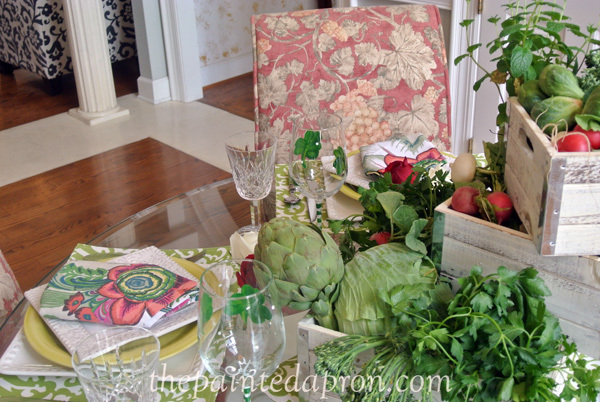 What a fun looking tablescape…it has me dreaming of warmer weather. I happy to hear that you are interested in the South Alabama Blogger Conference. I don’t know what is going on at Kim’s blog today, but here is her e-mail address. I love your crates spilling forth Jenna! Fruits and veggies in a centerpiece are as pretty as flowers and are more economical since they’re this week’s dinner 🙂 We’re ready for some warmer weather too. 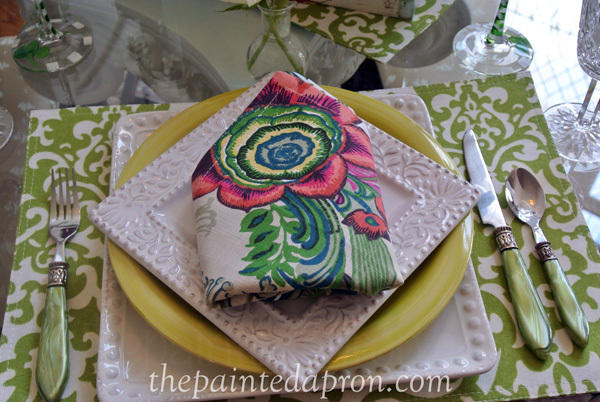 Love your blooming napkins! 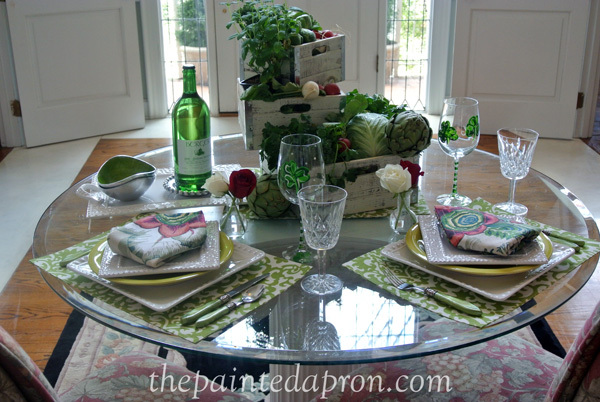 Very cute tablescape that is pretty and festive. 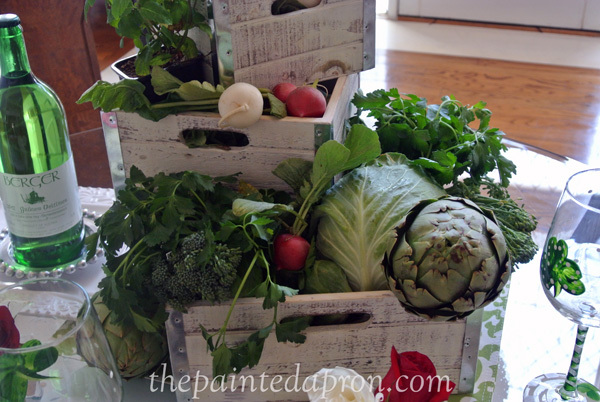 Love the crate idea! Dropping by from Susan’s party. 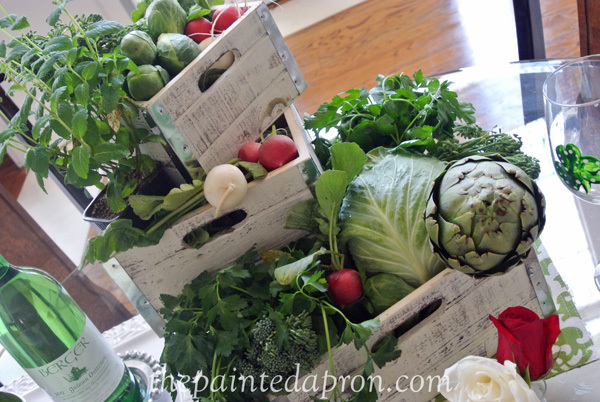 Love the crates- boy that makes me crave for summer and fresh veggies! 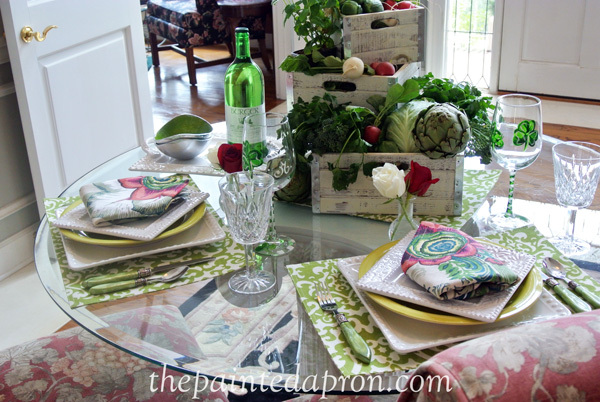 I enjoyed your mix of patterns wit the placemats and napkins- and the dish stack! Super job! Puts me in the mood for spring…and I love the pattern on your chairs. Pretty napkins too. Love!!! Everything!!! Where did you find the great napkins? Thank you so much!! I thought they looked familiar, but wanted to be sure. Once again, I LOVE your table! This is a surefire way to chase winter right on away!!! What a neat set up! 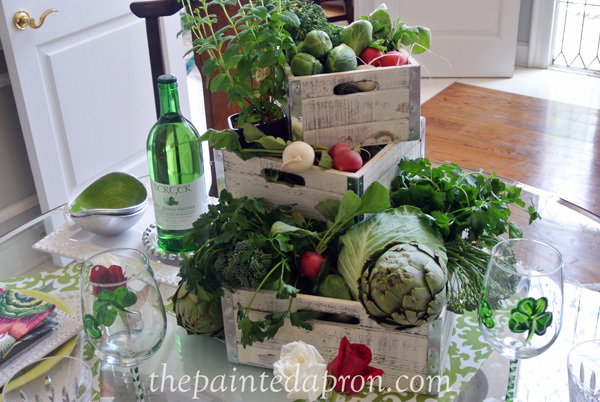 I love the use of the crates and all those garden fresh veggies!!! Farmers’ Markets are not far from being front and center here in the Midwest, and I’ll be happy to see those tents going up! Loving that placemat pattern!!! SO pretty! This must be therapy for so many of us! It’s all lovely and lush and green. The pop of red (radishes) is a bonus. My favorite part is the crate action going on there and how you stacked them with everything spilling over. Perfect! Your table is so cute!! 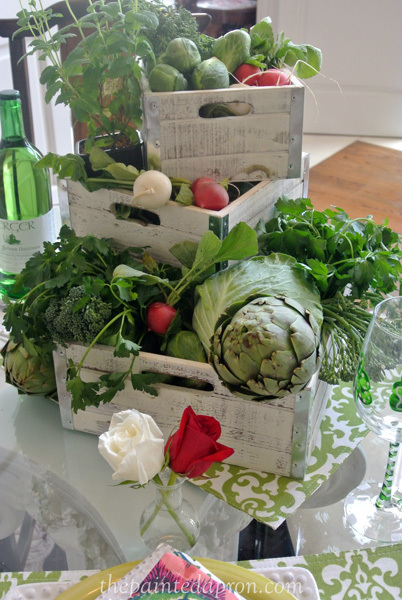 I love, love , love the crates!!! Maybe it is all the veggies but this just looks so fresh!! 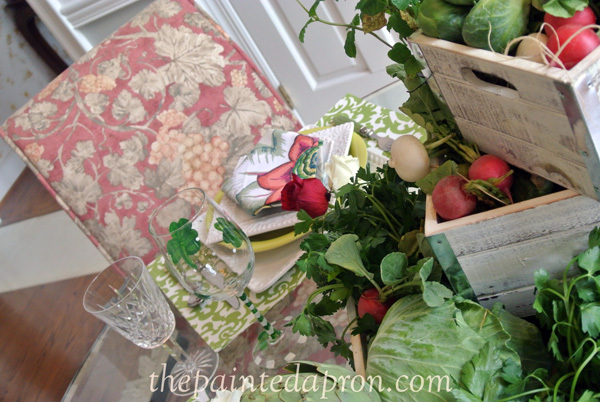 I like the way the radishes pick up the same color in those gorgeous napkins!! Great table!! Your table is lovely, and suddenly I am craving a salad 🙂 I would love for you to share at the Bacon Time linky, if you have not already. 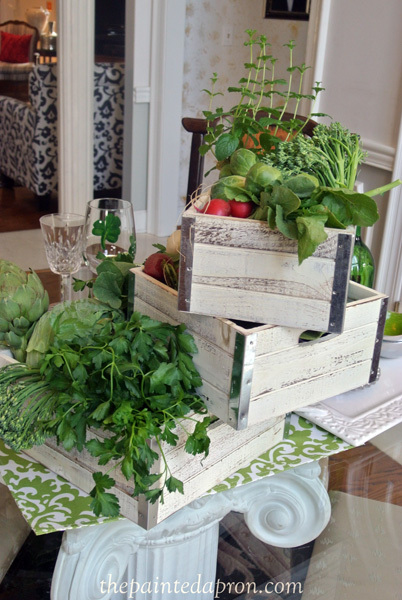 Clever centerpiece, and your table is perfect for spring. Love the crates and their contents. Thanks for bringing your creativity to Seasonal Sundays. Wow, thanks so much Karin!! 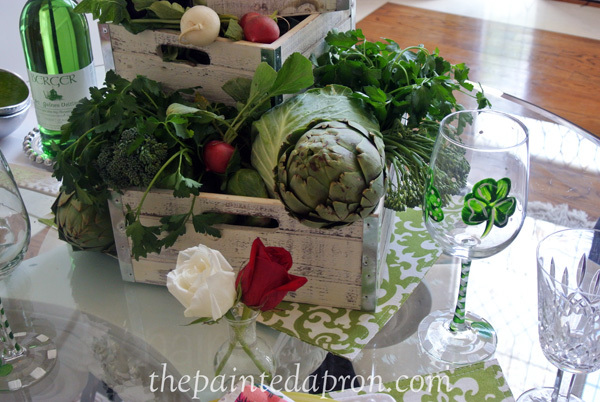 absolutely loved your centerpiece, and your table, Very very pretty and so springlike…………. Would be fun sitting at that table…………..
OMG Jenna…What a stunning table! It is so bright and refreshing. I would write a longer comment but I’ve got to go to the supermarket to buy some stuff so that I can copy your brilliant idea!! Have a great weekend!